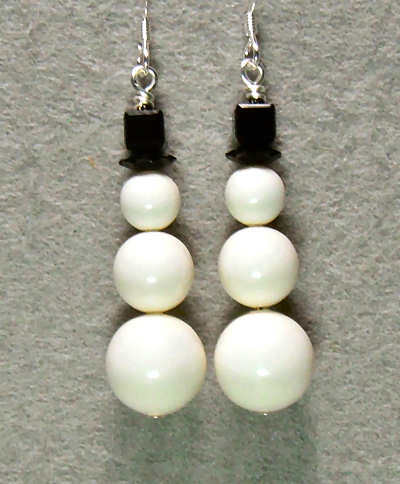 Cool Down With Snowman Earrings! This snowman earrings tutorial is kind of an “in between” look. It’s not holiday-only, like the Christmas tree earrings, nor is it a year ’round look like angel jewelry. But these teeny-tiny relatives of Frosty look good any time it’s winter! Like the other two pieces of jewelry mentioned above, these are beginner-level. Intermediate an advanced beaders will undoubtedly come up with their own takes of these classic earrings. Very simple for the supplies; you’ll need the following. I’ve made these with the Swarovski crystal beads in the new color called ivory. I thought it looked appropriately “snowy”, but this also looks amazing in crystal AB. You’ll also see a larger snowman that I made for a pendant, in the course of the video. He’s done in crystal AB. Now that I’ve said all that, it’s time for the video. I hope you enjoy it! DIY Cabs – Create a Faux Dichroic Look!